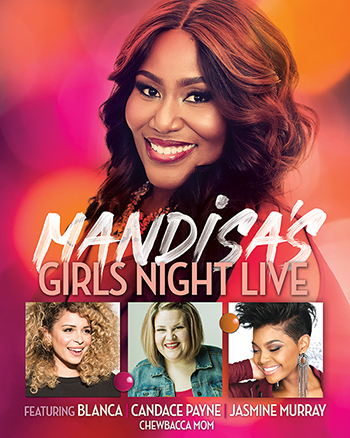 Mandisa is inviting her longtime friends Blanca, Candace Payne (author, “Chewbacca Mom”), and Jasmine Murray for “Girls Night Live,” an extraordinary evening aimed at strengthening female community. Envisioned to be a night of women encouraging women about matters that affect women, “Girls Night Live” will include music, humor, worship and prayer. The night will close with Mandisa and her friends joining the audience for a personal, encouraging “Girl Chat” and time of ministry. Mandisa’s desire is that each night will be different than the night before. With the added element of the “Girl Chat,” the audience will have the opportunity to shape the conversation. “My friends and I hope to create a safe atmosphere where the ladies will feel comfortable getting real, and discussing the topics that affect us as women, and the timely challenges we face,” said Mandisa. The 16-city run will visit churches, arenas and theaters throughout September 27 through October 21 in Texas, New York, Missouri, Florida and more. Food for the Hungry is sponsoring the community-filled evening and will give women the opportunity to help other women around the world. Providing life-changing resources such as clean water, medical aid, food, equal educational opportunities to girls and boys, vocational training and empowerment in the midst of unimaginable hardships, Food For The Hungry has been fighting poverty through purposeful relief and development for over four decades. Tickets for “Girls Night Live” will go on sale Friday July 27th. For more information, visit GNLtour.com.